Americans are obsessed with the great American road trip: it’s hard not to be, given the vast expanse of diverse states that make up the nation. Because most of us can’t make the trip itself, what better way to watch it than through the eyes of a famous British comedian driving a London cab around the country? That’s the premise of Stephen Fry in America, and the resulting miniseries is as delightful as it sounds. Fry sets off from Maine with the goal of hitting up every state. He spends more time in some than others (or more documentary time is devoted to some), but we get a taste and a witty or wise snippet from Fry about each of the 50 states. Watching I learned some things about America that I never knew, and I also got to see our country through the eyes of a clearly fond, insightful outsider. 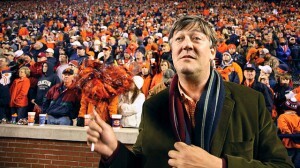 It’s hard to detail what happens in Stephen Fry in America, because that would ruin the fun. Anticipating what about each state Fry is going to choose to experience adds a lot to the miniseries. Of course, in some cases you might be disappointed. I’m a native Pennsylvanian from the Philadelphia region, so the three minutes Fry spent philosophizing in Gettysburg didn’t seem like enough to me. I wanted him to do more than that in PA, and my own expectations led me to not appreciate Fry’s thoughts at such an important place as much as I should have. Some states definitely get more attention than others. It’s just not possible to spend a long time in each place, but the series would wear thin if we only stopped in each location for a few minutes. Fry clearly has his biases about places he enjoys the most, as all of us would. 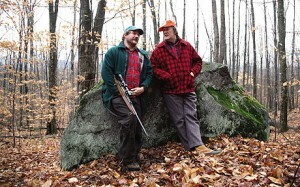 He approaches each location with good humor, and unearths some truly quirky things about the country. Fry reflects on the individual experiences he has more than on the tour as a whole, but he still has some interesting insights into the country. He’s never judgmental. His musings at a college football game in Alabama are profound, but what he has to say about the country overall, especially at the end, isn’t that revelatory. We’re a diverse nation of diverse states, people, experiences, landscapes, etc. That’s nothing we don’t already know. But Fry isn’t out to make a sound bite about America as a whole. The purpose of Stephen Fry in America is to show outsiders a glimpse of the country, and given that our nation is so big, even most Americans are outsiders in some of its corners. And of course, the real reason for the documentary miniseries is to entertain. And he hits up many great American road trip classics. Fry’s made to do things like ride horses – something he swore he’d never do again – and crawl through mine shafts much too small for him. He berates the American concept of cheese. In the grand tradition of travel shows, Fry pokes around in all the places he’s sent, looking to show off whatever part of the world he’s in with his natural humor and charisma. Let’s be honest: most of you knew from the title – Stephen Fry in America – whether or not you were interested in the miniseries. For many of us the title alone is enough to get us to watch it, and I can reassure those of you in that category that the series does not disappoint. If you’re not sure who Stephen Fry is, there’s no single good place to start learning about his wonderfulness. You can check out any of his many early comedy bits with Hugh Laurie – many of which are available on Netflix – but Stephen Fry in America is also a fantastic introduction. Travel miniseries aren’t usually the kind of thing we recommend around here on Netflix Instant Files, but when they’re this good, we have to bring attention to them. 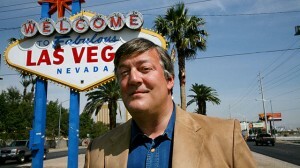 Stream Stephen Fry in America on Netflix Instant, or buy the DVD from Amazon. Fry also wrote a book with the same title about his experiences, which you can also find on Amazon.